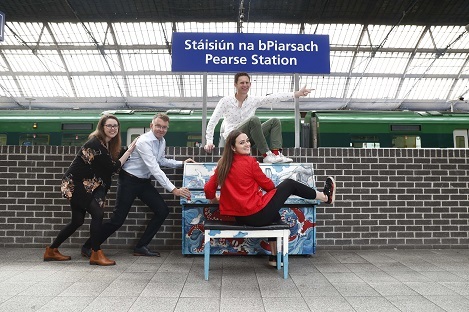 Tamar Keane, Smashing Times Theatre Company, visual artist Fergal McCarthy & pianist Máire Carroll with Andrew Hetherington, Chief Executive, Business to Arts at the Pearse Street Piano for the announcement of the recipients of the 2018 Small Grants Scheme under the Docklands Arts Fund. Picture: Conor McCabe Photography. Business to Arts are pleased to announce this year’s recipients of the 2018 Small Grants scheme under the Docklands Arts Fund. The objective of the Docklands Arts Fund is to enhance and develop the appreciation of quality art experiences in the Docklands area. Fergal McCarthy (visual artist), Máire Carroll (pianist) & Smashing Times Theatre and Film Company will receive funding for each of their projects, which will be based in Dublin’s Docklands over the next year. The Docklands Arts Fund, is a partnership between Business to Arts, Dublin City Council and local businesses and individuals. In 2017/2018, 60 people supported the Docklands Arts Fund through donations of cash and proceeds from the sale of the annual Docklands Arts Fund Print Commission. • Fergal McCarthy will spend several months researching source material relating to the Dublin Docklands to create a book, delivering an engaging, humorous account of the story of the Docklands. This book will be distributed without cost to local primary schools in the Docklands area, with Fergal hosting presentations of the project to school pupils. Read more about Fergal’s project here. • Pianist Máire Carroll will bring her Hidden Piano’s music series, aimed at bringing contemporary and classical music to new audiences in unexpected places, to primary school students in the Docklands area. Máire will work with students to engage and encourage them to explore music, and together compose a piece using their individual musical and lyrical ideas. Read more about Máire’s project here. • Smashing Times Theatre and Film Company is a professional company involved in performance, training and participation. The company will deliver 4 participatory drama workshops, theatre performances and post-show discussions in the Docklands area to promote positive mental health and suicide prevention as part of ‘Acting for the Future’. Read more about their project here.